Basal cell carcinoma, Bcc, BCC, Dermoscopy, Dermoscopedia Basal cell carcinoma – cite! Basal cell carcinoma (message) Basal cell carcinoma – participate! Basal cell carcinomais the most common skin cancer, and one of the most common cancers in the United States. While BCC has a very low metastatic risk, this tumor can cause significant disfigurement by invading surrounding tissues (BCCAbbreviation for Basal Cell Carcinoma) is the most common type of skin cancerThis glossary term has not yet been described. in the world. Although mortality related to BCC is negligible, BCCs can be associated with significant morbidity, especially if left untreated and/or if discovered when they have attained relatively large diameters. Clinically, BCC can present with a variety of morphologies ranging from erythematous patches to ulcerated nodules. There are multiple histopathologic subtypes of BCC including superficialThis glossary term has not yet been described., nodularThis glossary term has not yet been described., morpheaform/sclerosing/infiltrative, fibroepithelioma of Pinkus, microcytic adnexal and baso-squamous cell BCC. Each subtype can be clinically pigmented or non-pigmentedThis glossary term has not yet been described.. It is not uncommon for BCCs to display pigment on dermoscopy with up to 30% of clinically non-pigmented BCCs revealing pigment on dermoscopy . Based on the degree of pigmentation, some BCCs can mimic melanomas or other pigmented skin lesions . Depending on the subtype of BCC and the degree of pigmentation, the clinical differential diagnosisis the identification of the nature and cause of a certain phenomenon. Diagnosis is used in many different disciplines with variations in the use of logic, analytics, and experience to determine "cause and effect". In systems engineering and computer science, it is typically used to determine the causes of symptoms, mitigations, and solutions can be quite broad ranging from benignis any condition that is harmless in the long run inflammatoryThis glossary term has not yet been described. lesions to melanomaThis glossary term has not yet been described.. Fortunately, the use of dermoscopy has dramatically improved the diagnostic accuracyThis glossary term has not yet been described. and diagnostic confidence of clinicians for both pigmented and non-pigmented BCCs (Schematics show the features seen in pigmented and non-pigmented BCC). In addition, dermoscopy permits for the diagnosis of clinically tiny BCCs since the dermoscopic criteriameasure of how well one variable or set of variables predicts an outcome for BCC are visible irrespective of the size of the tumor . File created by Natalia Jaimes. The nests are defined as confluent or nearly confluent, well-circumscribed, pigmented ovoid areas. 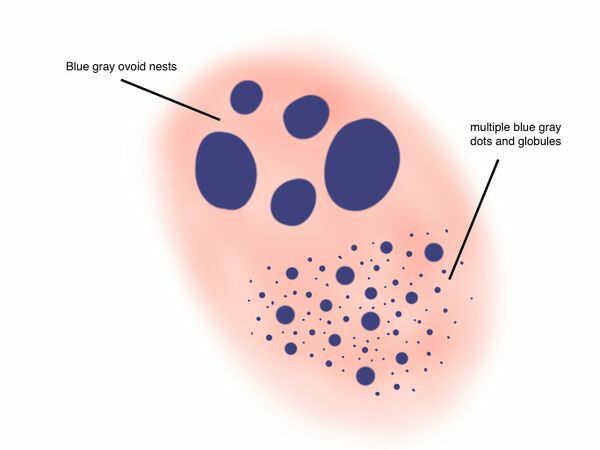 The difference between an ovoid nest and a blue-gray globuleThis glossary term has not yet been described. is the relative size of the structure. An ovoid nest encompasses at least 10% of the surface area of the lesion and blue-gray globules are smaller. The presence of an ovoid nest corresponds to basal cell tumor islands in the dermis and these lesions will prove to be nodular BCC on histopathologyThis glossary term has not yet been described..
Pigmented BCC (polarized lightThis glossary term has not yet been described. 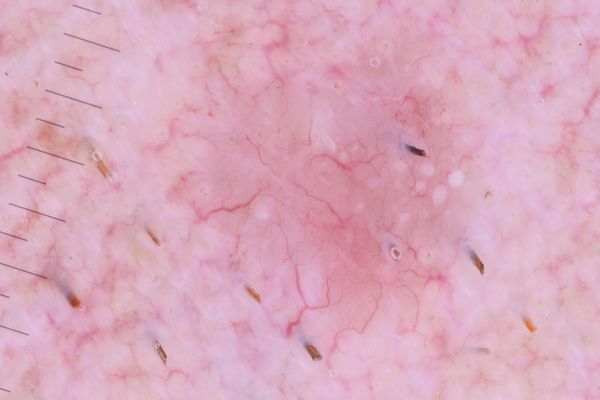 dermoscopy) displaying a large blue-gray ovoid nest, multiple non-aggregated blue-gray dots and globules, shiny white strands and an arborizing vessel. Blue-gray dotsDots are small, round structures of less than 0.1 mm in diameter that have a red color when corresponding to blood vessels; however, when due to melanin, their color ranges from black, brown, to blue-gray depending on the depth and concentration of the melanin in the skin (Tyndall effect). 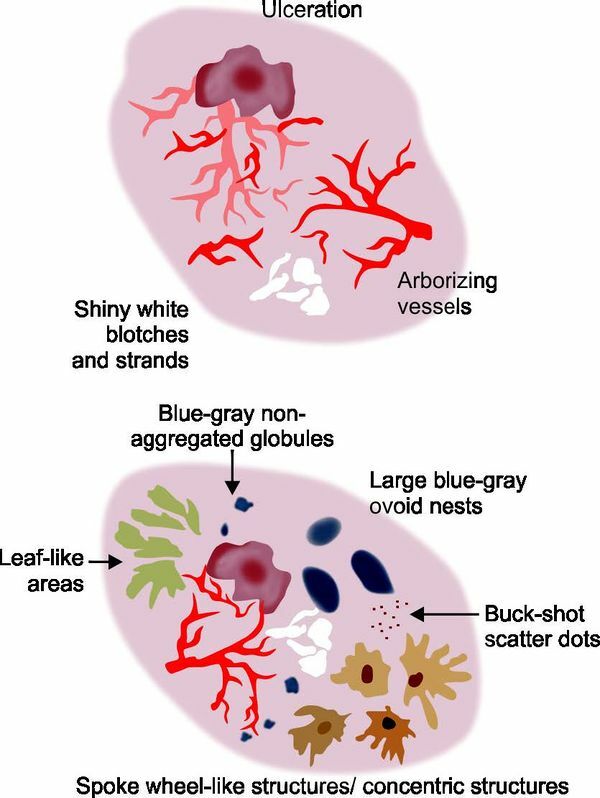 are pinpoint blue-gray structures that are often distributed in a buckshot scatter like pattern (Figure ). This structure can be seen in early nodular BCC or in superficial BCC. Blue-gray globules are well-defined round or oval structures, larger than dots, but smaller than large ovoid nests. They are not aggregated as would be seen in melanocytic lesions. They usually have a blue-gray colorColor (American English) or colour (Commonwealth English) is the characteristic of human visual perception described through color categories, with names such as red, yellow, purple, or blue. ; however, depending on the location within the dermis (Tyndall effectCaused by light scattering by particles in a medium. The longer-wavelength light is more transmitted while the shorter-wavelength light is more reflected via scattering.) and degree of melanin within the pigmented basaloid tumor islands, the globules can appear brown or pink in color. This structure corresponds to small basal cell tumor islands in the dermis and thus they will prove to be nodular BCC on histopathology. These areas are defined as discrete, linear to bulbous extensions connected at an off-center base area, forming a leaf-like pattern. They are usually brown or gray-blue in color (Figure ). This structure is quite specific for superficial BCC. The bulbous to linear extensions forming the leaf can sometimes be mistaken for streaks seen in melanoma. 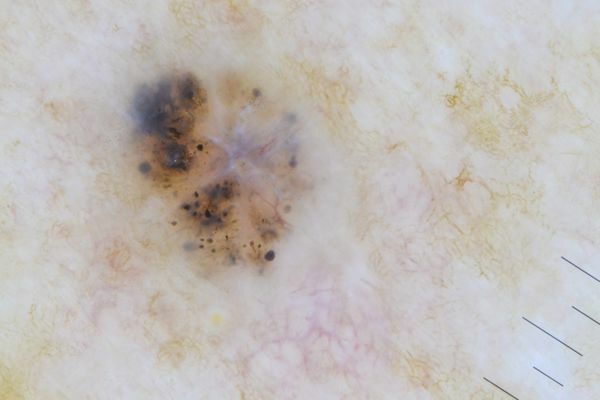 However, the streaks in melanoma tend to be discrete, well-delineated, narrow, relatively in-focus linear extensions that are located at the perimeter of the lesion and are directly connected to the main pigmented tumor mass. Streakslines radial (always at periphery) streaks Reed nevus melanoma recurrent nevus in melanoma always radiate in a direction pointing away from the main pigmented tumor mass and they radiate toward normal skinThis glossary term has not yet been described.. 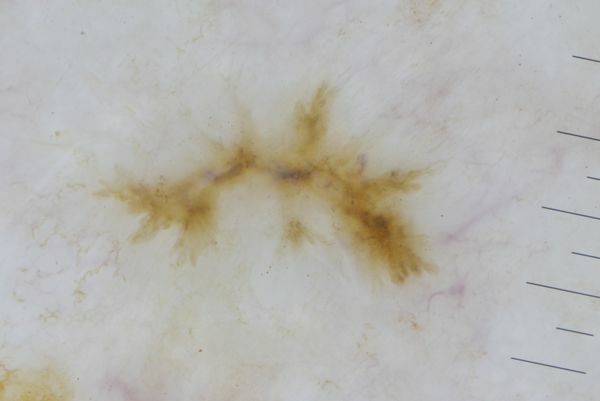 In addition, streaks in a melanoma appear to converge towards the geometric center of the lesion, which is often hyperpigmented and has a blue-white veil. In contrast, extensions seen in leaf-like structures tend to be broader and often appear “fuzzy” or out of focus. They do not have to be located at the lesion’s perimeter and they do not always have to radiate away from the main tumor mass toward normal skin. In addition, the extensions seen in BCC tend to converge at an off center pigmented base. This base together with its “extensions” is present focally and most often located towards the periphery of the tumor and it is this configuration that creates the leaf-like structure. In addition, the geometric center of BCCs manifesting “fuzzy streaks” (leaf-like areasBrown to gray/blue discrete linear or bulbous structures coalescing at a common off center base creating structures that resemble a leaf-like pattern.) is often hypopigmented and relatively structurelessThis glossary term has not yet been described.. These are radial projections that surround a central darker pointThis glossary term has not yet been described.. This is similar to leaf-like structures described above but instead of having the radial projections converging at an off-center base they radiate around a central base. The projections have a tan, blue, or gray color, and the central point or hub is usually dark brown, blue, or black (Figure ). At times the radial projections are not well defined and the spoke-wheel-like structure appears as a brownish round ill marginated globule that has a central darker hub; this particular patterned structure is called the ‘’’concentric structure’’’ or ‘’’concentric globule’’’. (Figure ). The spoke-wheel-like structure (including the concentric structure) is highly specific for superficial BCCs. These consist of multiple branching blood vesselsare the part of the circulatory system, and microcirculation, that transports blood throughout the human bodyThis glossary term has not yet been described. in a tree-like pattern. The base of the vessel is larger and the branches of the vessel become smaller in diameter. The vesselsThis glossary term has not yet been described. tend to be bright red and sharply in focus. Arborizing vesselsanalytic term is branched vessels; Bright red sharply in focus large or thick diameter vessels dividing into smaller vessels; BCC surround dermal basal cell tumor islands and thus are associated with nodular BCC. These structures consist of shallow erosions that may be covered with congealed blood. They can also appear to have an orange hue if covered with a serous crust. Ulcers covering at least 10% of the surface area of the BCC correspond with nodular BCC. The presence of multiple smaller ulcers, termed erosions, is a feature seen in superficial BCC. 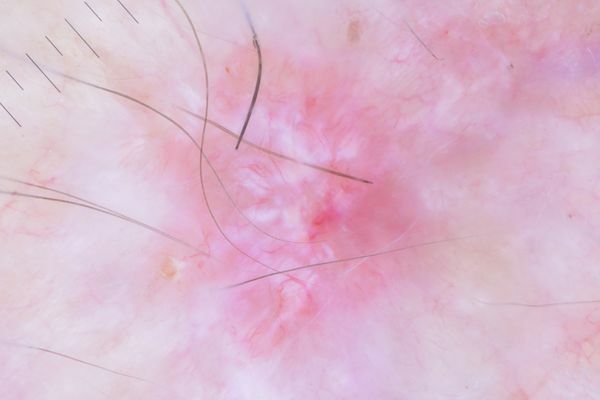 This structure can only be seen with polarized dermoscopy and consists of white patches or blotches and linear white areas called strands . ↑ Lallas et al. : Dermoscopy uncovers clinically undetectable pigmentation in basal cell carcinoma. Br. J. Dermatol. 2014;170:192-5. PMID: 24117444. DOI. ↑ Bakos et al. : Radial streaking: unusual dermoscopic pattern in pigmented superficial basal cell carcinoma. J Eur Acad Dermatol Venereol 2007;21:1263-5. PMID: 17894724. DOI. ↑ 3.0 3.1 Altamura et al. : Dermatoscopy of basal cell carcinoma: morphologic variability of global and local features and accuracy of diagnosis. J. Am. Acad. Dermatol. 2010;62:67-75. PMID: 19828209. DOI. ↑ Popadić & Vukićević: What is the impact of tumour size on dermoscopic diagnosis of BCC?. J Eur Acad Dermatol Venereol 2015;29:2474-8. PMID: 25358026. DOI. 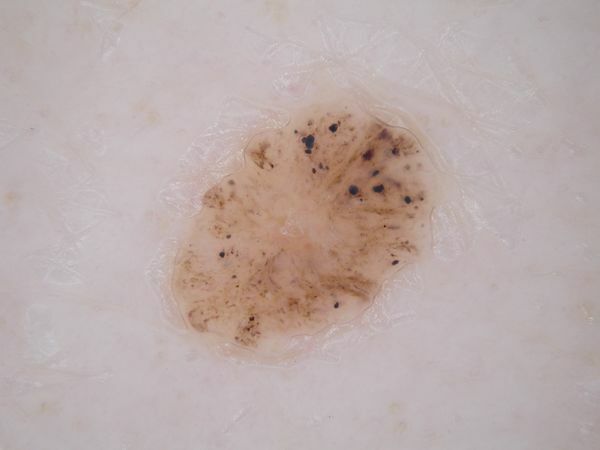 ↑ Menzies &: Dermoscopy of pigmented basal cell carcinoma. Clin. Dermatol. 2002;20:268-9. PMID: 12074864. ↑ Menzies et al. : Surface microscopy of pigmented basal cell carcinoma. Arch Dermatol 2000;136:1012-6. PMID: 10926737. ↑ Navarrete-Dechent et al. : Association of Shiny White Blotches and Strands With Nonpigmented Basal Cell Carcinoma: Evaluation of an Additional Dermoscopic Diagnostic Criterion. JAMA Dermatol 2016;152:546-52. PMID: 26792406. DOI. This page was last modified on 17 October 2018, at 23:28. This page has been accessed 8,385 times.